Welcome to the Port Authority of New York and New Jersey ... and now Buffalo. Every week, massive container ships arrive at New York Harbor, after passing under the raised Bayonne Bridge between Staten Island and New Jersey. Workers quickly unload thousands of blocky containers at the port and put them on big trucks, sending the goods to their destination while clearing the way for the next ship to come in. It's a system that's worked well for years, but now, the New York City port is too busy to handle the volume that it gets. That's where the vision behind creating a new transportation and logistics hub along the Buffalo waterfront could come into play. Instead of unloading the containers at the New York port and putting them on trucks there, the idea is to unload the containers onto a train that would take them to Buffalo, where they would be put on trucks in a new depot at the Buffalo Lakeside Commerce Park and sent off to their destinations. Backers, which include Amherst-based Uniland Development Co., say it's a win-win proposition. The Port Authority needs inland distribution facilities located on rail lines to handle its growing volume. For Buffalo, the logistics hub would take advantage of the city's location within 500 miles of most major metro areas in the Northeast, Midwest and eastern Canada, while also bringing new jobs to the area. "It’s very significant," said Buffalo Mayor Byron W. Brown. "Anything that we can do to enhance the visibility of the city and do it in a way that we are recruiting a company in one of four targeted industries is a very, very positive thing. And this will make us even more attractive for development." The project is a new twist on a decade-old vision to focus on logistics, given Western New York's location on the Great Lakes, its proximity to Canada, and its position along major highway and rail lines. Some 26,000 shipping containers already make their way back and forth between New York and Buffalo every year, by truck. "We are a logistics hub. We have been since the terminus of the Erie Canal," said Craig W. Turner, executive director of the collaboration, called Buffalo Niagara International Trade Gateway Organization, or ITGO. "What we started to do years ago was start to market it that way." Most significantly, supporters say, Buffalo is part of the third-largest and fastest-growing metropolitan region in North America — the horseshoe zone stretching from Toronto to Rochester. The import demand of that major region, coupled with the presence of a large trans-shipment facility in the area, would result in more shipping containers being emptied locally and then reloaded with exports from manufacturers in Western New York and southern Ontario. That, in turn, addresses a longstanding shortage that has hampered those companies' growth, and even hindered Invest Buffalo Niagara and Empire State Development Corp. when they try to lure companies to locate here. "For our purposes here, it's about the containers. We have a very good ecosystem here, except for the containers," Turner said. "The whole purpose of this facility is to capture those containers for use by manufacturers in our region on both sides of the border." ITGO was started by companies such as BorderWorx Logistics, Roar Logistics, Speed Global, Sonwil Distribution, Wendel Architecture & Engineering, law firm Phillips Lytle, the Peace Bridge Authority and the Niagara Falls Bridge Commission. It's led by Turner, who is also president of World Trade Center Buffalo Niagara and founder and president of Momentum Public Affairs. The organization grew out of a working group that was created to implement recommendations made by the Greater Buffalo Niagara Regional Transportation Council in 2010, which highlighted the potential of logistics to become a driving force in the Buffalo Niagara economy. Until now, the idea of Buffalo as a train-based shipping hub for New York City has been mostly a vague concept, based around years of conversations, and a five-year-old memorandum of understanding that designated the Buffalo Niagara region as a "strategic international gateway" for the Port Authority. The agreement called for joint marketing and messaging to ocean carriers and businesses, data-sharing, and collaboration on freight strategy, and Port Authority representatives sit on ITGO's advisory group. "We have a great relationship with them," Turner said. 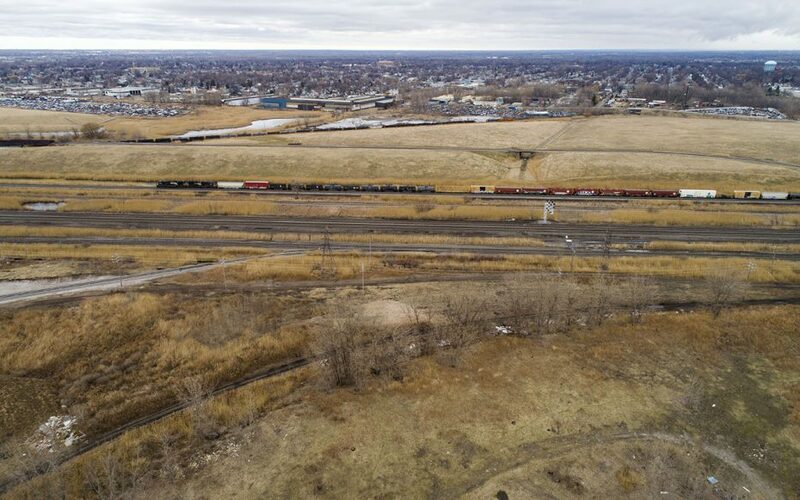 Officials first discussed the idea of a depot in Buffalo several years and even spoke with CSX, but it fell by the wayside until two years ago. Now, ITGO is taking a major step toward making it a reality, by acquiring the necessary real estate. The Buffalo Urban Development Corp. on Tuesday agreed to sell a 20.34-acre parcel of land at 255 Ship Canal Parkway - in the Buffalo Lakeside Commerce Park in South Buffalo - to Uniland for $509,000. That's $25,019 per acre. Uniland - which signed on to the project last year - will work with ITGO to develop a logistics hub at the site, enabling Buffalo to become an "inland port" location for the Port Authority. There are four large freight trains a week that go to Buffalo from the port in New York. That will capitalize on the expansion of international shipping at the Port of New York & New Jersey, which has been overwhelmed since the Panama Canal was enlarged and the Bayonne Bridge was raised to accommodate much larger "Panamax" ships that handle 17,000 containers each. "They were congested even before they enlarged the Panama Canal, and then with that enlargement, they realized they need relief," said David Stebbins, BUDC executive vice president. "They can’t unload everything at the Port Authority. They need to ship stuff inland, on trains, and have them unload in different areas." The Port Authority had already invested $600 million over the last decade to increase efficiency, including with direct access to rail lines. But before December 2017, when the Bayonne Bridge was raised, the biggest ship that came to New York had 12,000 containers. Also adding to the pressure are new federal rules about how long truck drivers can go before they have to stop and rest for the day, setting a new limit of 10 hours at a time. That's not enough time to get to Buffalo and back to New York in one day, let alone more distant cities, so it changed the economics of those trip for shippers. Instead of sending a second driver or paying for a hotel, they decided to turn to rail. Two years ago, the Port Authority asked ITGO officials again about the rails-to-trucks idea. Talks progressed, and Uniland approached the group after learning about the concept. The developer and ITGO then approached BUDC in late 2018, and negotiated the purchase agreement. The proposed site is located on the eastern side of Buffalo Lakeside Commerce Park, between Sonwil Distribution and Certainteed. It has direct access to CSX Rail's main line, with a short road being completed to link them. Preliminary plans by architects at Wendel Cos. call for a 20,000-square-foot facility with 40 loading docks, plus some office space, but Turner said it could ultimately be larger. It's also expected to include solar panels and electric-vehicle charging stations. Ultimately, it could handle at least 30,000 containers annually. The cost is still uncertain, as is the time frame. "It'll be a boon to the region if we can get this up and running soon," Turner said. "It was an idea scribbled on a napkin seven or eight years ago, and all of a sudden we're moving toward something. It's going to be a benefit for manufacturers in the region." But it's not a sure thing. "There's no guarantee that Buffalo has that yet, but the hope is that by developing this facility, it gives us a leg up to be able to attract that type of business here," Stebbins said. "Once we have that core piece of infrastructure, we have the ability to attract other businesses that need better access to port facilities."